I don't know about you, but I worry. A lot. When circumstances are out of my control, I fear the unknown... will things turn out okay? Still God has proven time and time again that He will always provide for every need. In His way, in His time... not in mine. For this page, I really wanted a simple reminder of that because frankly I need it often. I must admit this page didn't turn out quite like I'd imagined. 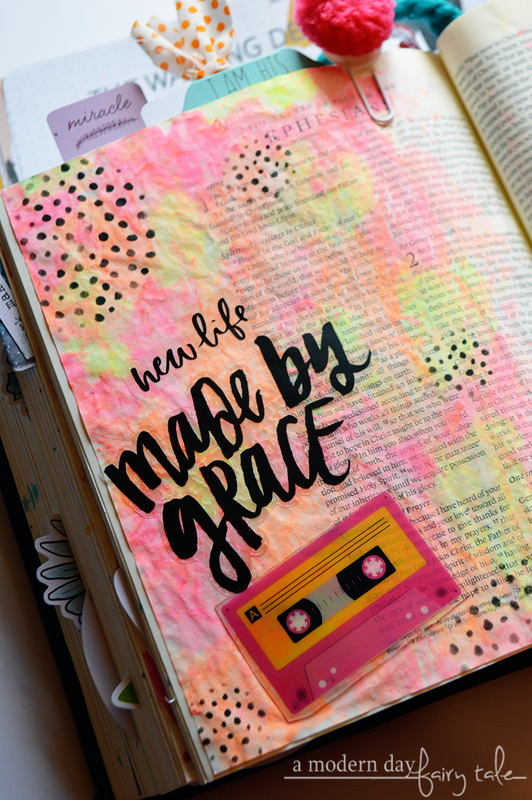 In fact, this isn't a page I would normally share, but Bible journaling isn't about perfection. It's not about great art or beautiful pages or how skillful the journaler is. It is about that time with God and the messages that we learn in the process. With a name like '100 Days of Grace and Gratitude', needless to say the subject of Grace is one that is revisited time and time again in various ways throughout this journal. This day however take a look at well... a different kind of grace. Saying grace, that is! This is something that is such a common part of our lives as Christians that we might not even think twice about the act, so it was nice to take that moment and celebrate it a bit. The scriptures in this devotion talked a lot about breaking bread. As I read through that, I was reminded of this cute die cut from the 'Patio Party' collection from Jen Hadfield. I mean, it literally has bread right there! I kept it simple with some burlap alpha stickers that I felt really went well with this style! Now, don't worry! We're not talking about zombies in today's devotion. Rather we are talking about how thanks to grace we have been given a brand new life in Christ! 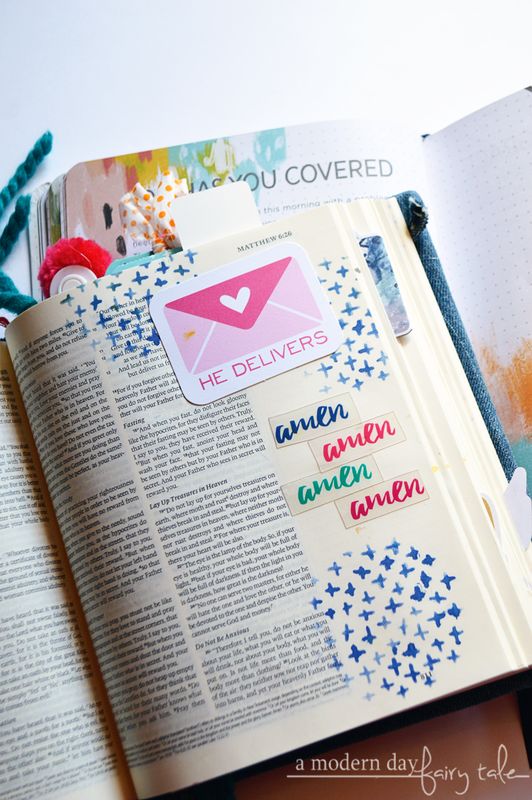 Upon reading this devotion, I knew that I wanted to use these Illustrated Faith script stickers... but I wasn't sure where I was going beyond there. I always love how these particular style stickers pop against a vibrant background so I grabbed some colors and went to work. After the page was complete, I couldn't help but think the neon colors I'd chosen really gave a fun 80s/90s vibe so I went with it and finished off the look with a clear cut from the Illustrated Faith 'Bright and Brave' collection. We are our own worst critic, aren't we? In everything we do it seems we are the one judging us the most harshly. Oftentimes, though we know the scripture, we can find ourselves dwelling in the idea that perhaps we are not worthy of mercy. We need this reminder that mercy will win every single time. For this page again, I wanted a bold and colorful background but I went with a few softer colors this time around. 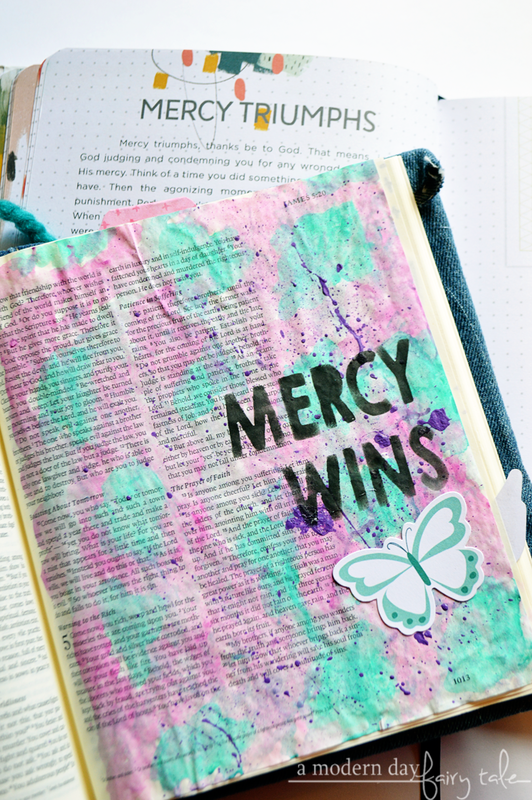 Now, I must say I was half tempted to have some fun with one of my favorite shows 'Full House/Fuller House' and feature the famous catch phrase '"Have Mercy"... but I decided to keep it a little more classic and share this powerful message: Mercy Wins. I love songs of praise! Oftentimes, some of us can take our faith a little too seriously. Are we doing everything that God has asked us to do? Are we being 'good Christians? Instead, we need to focus more on giving thanks. Singing His praises. Celebrating His amazing gifts! This was another page for which the 'Patio Party' collection was the absolute perfect fit. I knew this cute cake die cut would be perfect but when I found this cute party time graphic, I decided it would make for a great tip in- with room to journal on the back. 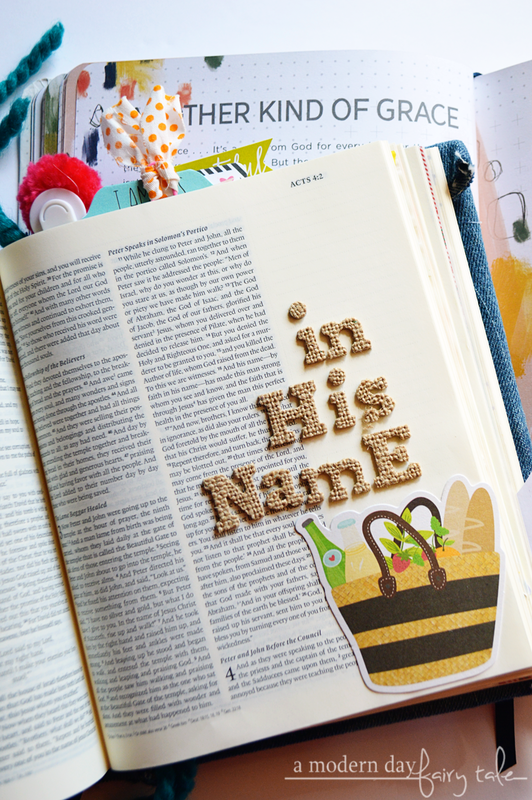 Once again I love how beautifully this burlap letters coordinate with these other elements. When you are praying, how does it sound? Is it more "please God" than "thank you God"? While we certainly can and should come to God with our requests... we must also be sure that we are balancing out and giving thanks for all that He has given us... for the answered prayers and the unanswered prayers as well. For this page, I really wanted to focus on those three simple words. God is good. 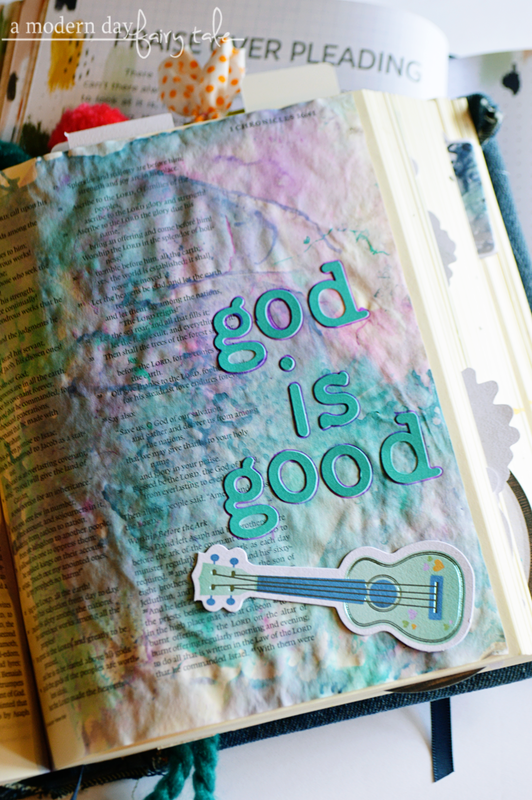 I did a fun watercolor effect using acrylic paints for the background and decided to play on the idea of singing praises and lifting Him up in song with this cute little guitar die cut that coordinated so perfectly! 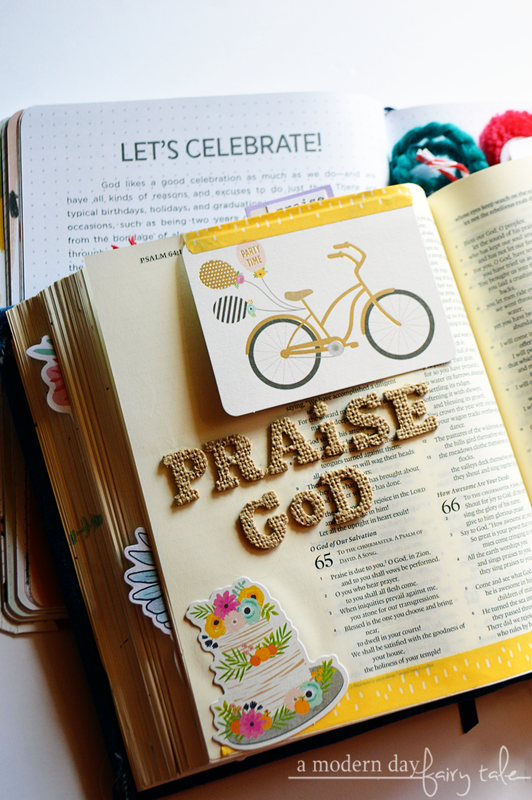 Another day, another post about praise...and I love it! This one is talking about giving thanks even in the hard time. And let's be honest, life has a way of piling those hard times on sometimes. It's easy enough to rejoice when times are good... but it is just as important--- perhaps even moreso--- to keep on singing even in the rain. For this page, I really wanted to keep with that rain theme. I used a cloud die cut from Illustrated Faith for a rain cloud and then various colors of ink to create a rainy day look. 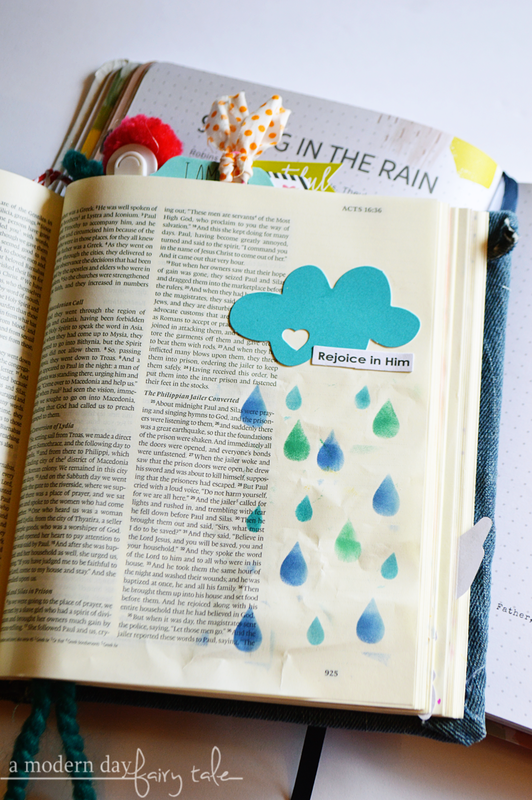 For the raindrops, I used an outline from an Illustrated Faith sticker collection that I'd already used on previous pages. I loved finding a new use for a piece that would have otherwise been tossed out!